Appearance: Being Moka's older sister, Rosario looks like her, only difference is her hair is silver in color & her hips & chest area are a little larger. Her eyes are a reddish color & in some cases in boys, she has the looks of a "vampire," meaning her pupile would sometimes look like they're cat eyed. She sometimes would wear the same type of clothing her sister would wear, but she someimes can wear whatever else she wishes. Personality: Rosario is highly aristocratic and arrogant, looking down upon all manner of Yōkai for their audacity to challenge her. 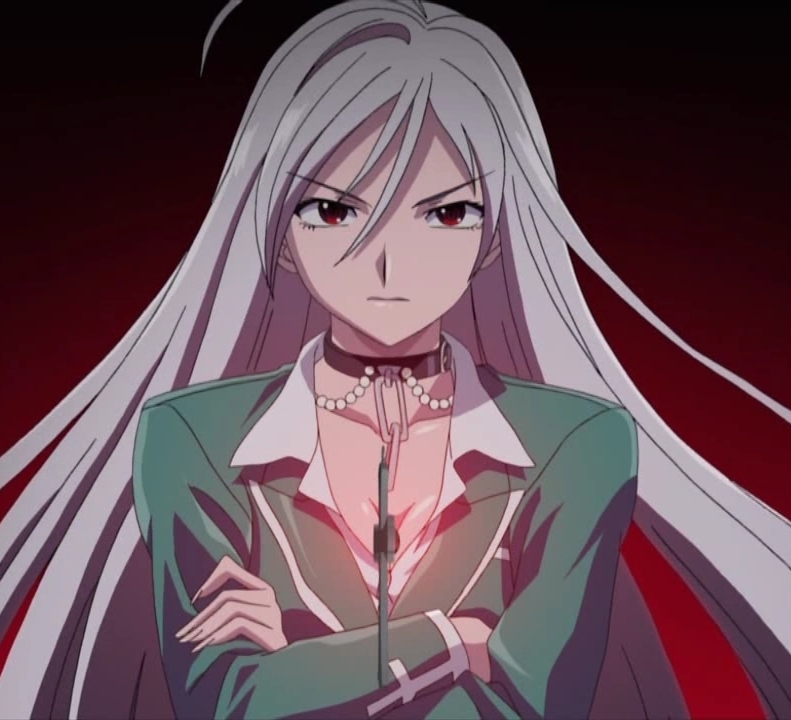 She normally punishes the bullies who dare pick on Tsukune & (or) Moka for various reasons and depending on how they treated her sister & her friend. Rosario tended to be slightly amused at Tsukune's attempts to assist her despite him being a 'mere human'. She claimed her personal interest in protecting him was due to his affections toward her sister, but also to keep Moka happy at the same time. Sometimes, she would tease Tskune & tricking him that both she & Moka were "vampires" all just to get a good scare from him & a laugh to herself. Hobbies: dinosaur fighting, vampires & halloween related "monsters"
Biography: Rosario was originally born in Japan. She was always the good little girl until her sister, Moka was born, who she's sworn to protect at all times. She would often teach her various things, like animals & dinosaurs & school. One day, she learnt that Moka had a few nightmares & knows of her scared fear of swimming or even going near water. She would always try to encourage her sister that there was nothing to fear in swimming. But poor Moka was still scared & Rosario gave up on trying to encourage her to swim. When High School came, she became the smartest beautifull girl in the school, despite her wide knowledge on dinosaurs & prehistoric animals. After graduating High School, she learnt about dinosaurs being created & the JFC tournaments. She then bought herself a few dinosaurs & became a good fighter quickly. She soon learnt her sister has a very good friend, Tskune Aono. Seeing that he & Moka have a good relationship, in terms of friendship, she treats him like he was her younger brother, despite if she sometimes likes to pick on him. She also hopes that he would help Moka overcome her fear of swimming & the water.